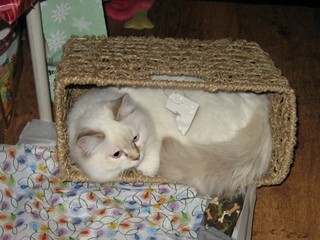 We are a small cattery, presently with two breeding females and one breeding male. 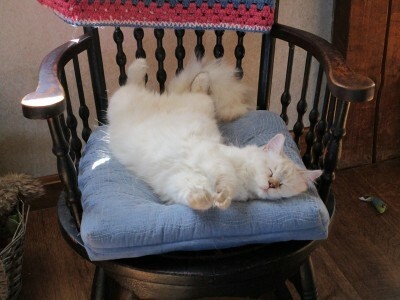 Our breeding cats are our pets too, and the females have the run of the house. Our stud boy has to be kept separated to assure a good breeding program. He spends his time in our Family Room, so is never lonesome, and when it is warm enough he can go out on our screened porch. Ragdolls do love their people, so we don’t like to have him isolated. All of our breeder cats have been tested, or their parents have been tested, for the gene that causes hypertrophic cardiomyopathy (HCM) in Ragdolls. All of them either tested negative themselves, or both of their parents tested negative. If the parents are both negative, then the offspring is negative. Cowboy on his cat tree. 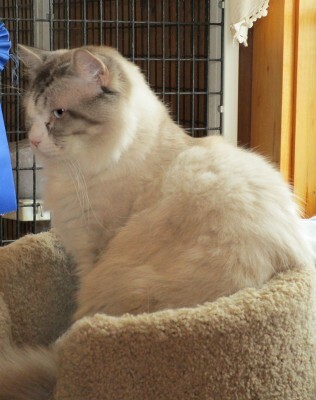 Cowboy is a seal mitted lynxpoint with a white mask that looks like a bicolor mask. 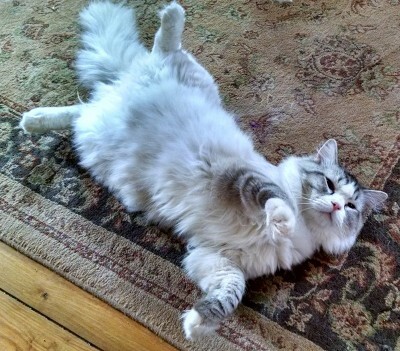 He is large, quite vocal, and loves to roll on his back to have his tummy rubbed. His sire is a Supreme Grand Champion and his dam is a Grand Champion, so he comes from top-shelf Ragdoll stock. His sire’s color is chocolate and his dam’s is blue, so Cowboy carries both blue and chocolate genetics. This will allow us to produce chocolate kittens with Shakira as well as blue and seal kittens with her and Cassadee. Because he has the bicolor mask, Cowboy is not eligible to show. However, he has beautiful type and a plush bunny coat. His kittens have been wonderful, in both type and temperament. Shakira curled up in a magazine rack I got for Christmas. 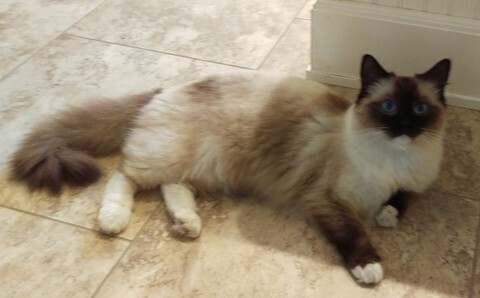 Shakira is a beautiful chocolate lynxpoint Ragdoll with the most sweet and floppy temperment. I met Shakira’s sire, Tekila Moon, at a show, and he was such a beautiful, sweet boy, with a beautiful lilac lynxpoint coat. He also had reached the highest title of Master Grand Champion in CFF. So I told his owner, Pam Scungio, that I wanted one of his kittens. He didn’t disappoint, as Shakira is everything I had wanted in a Ragdoll. 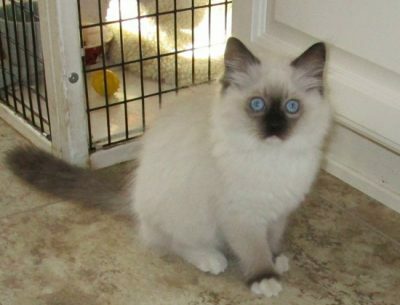 Bred to Cowboy, Shakira can make chocolate, blue, and seal colored kittens in mitted and colorpoint patterns. Statistically, 75% would be lynxpoint and 25% would be non-lynx. Her kittens are the most wonderful, friendly, beautiful kittens as anyone could want. There were two chocolates in her first litter, along with seals and blues, plus some lynxpoints. Cassie is our newest female. She is a sealpoint mitted girl with a wonderful personality. She has an old pedigree, with a FossMtn cat as one of her grandfathers. We have great hopes for her kittens. Since her father was a bluepoint, she carries the gene for blue. So with Cowboy, she would make kittens in all three patterns with some blue, some seal and some with the lynx striping. Cassie at four months old.